It is my pleasure to share Teesside University’s ambitious plans and our role in driving forward the entrepreneurial eco system here in the Tees Valley. Teesside University is proud of our regional heritage and our achievements to date. But we also acknowledge the challenges of the future. I would propose that, collectively, we are in a strong position to face these challenges, and through shared values and a clear vision, we can deliver wealth, impact and recognition for the region. My vision for the Business School is that it is a global home of enterprising and confident graduates; a business school where learning occurs on campus, in businesses and online; that it includes learning that involves supporting businesses to accelerate their growth and graduates who springboard to their career of choice. I believe that the traditional business school models are no longer fit for purpose. Too often, they are vanilla in course options and washed out in content. Here at Teesside University Business School, we intend disrupting that norm. Our portfolio will be relevant and fit for purpose. What we build we will build in partnership with you, the employers of our graduates. We will be agile and flexible in what we offer, and are unequivocal in ensuring our learners receive an outstanding student experience. This is a path we have already embarked on – with marked success in a number of national and global rankings, including 100% satisfaction for our accounting degree over the last two years. We have relaunched our MBA programme under the levy model with more than 50 businesses already benefitting from this route to leadership development. We are very clear about our positioning in the marketplace. The Business School will be recognised for its focus on entrepreneurship, enterprise and employability creating, confident graduates who can contribute immediately in the world of work. Our graduates will demonstrate their knowledge and understanding to merit qualifications at degree, masters and doctoral levels, but more than that, they can apply this learning in your organisation to improve productivity, develop new markets, or analyse performance. Academically underpinned, interactively delivered and when possible practically assessed, we will provide useful, valuable learning that makes a difference to individuals, businesses and communities – locally, nationally and internationally. So how, then, does this vision align with regional aspirations and how can we together face future challenges? When Lord Heseltine visited the Tees Valley following the announcement of the closure of the SSI steelworks in 2015, he recognised the need for a strong social and economic infrastructure as the foundation for growth. The Tees Valley Combined Authority took this report as the catalyst for the development of their Strategic Economic Plan, which strongly communicates a core message to be proud and positive about our region. We have made inroads over the last three years against an extremely challenging environment, with a skills agenda at the heart of this plan. A recently published World Economic Forum report proposes that the new world of work is rapidly becoming a lived reality for millions of workers and companies around the globe, and that opportunities for economic prosperity and social progress are enormous. To create positive outcomes for all will require bold leadership and an entrepreneurial spirit from businesses and governments, as well as an agile mindset of lifelong learning from employees. It report argues that it is critical for businesses to take an active role in supporting their existing workforces through reskilling and upskilling, and with individuals taking a proactive approach to their own lifelong learning. Finally, it proposes that governments create an enabling environment, rapidly and creatively, to assist in these efforts. We are all familiar with high-speed mobile internet, artificial intelligence, widespread adoption of big data analytics and cloud technology, but these were just the appetiser. As employers, we must be alert to the rapidly changing landscape. Some food for thought. By 2022, it is predicted that 65% of children entering primary schools today will ultimately work in new jobs and functions that don’t currently exist. By 2026 the Tees Valley will have 127,000 job vacancies. But will we have employees with the correct skills? At present the answer is “no”, as 45% of businesses are currently indicating skills shortages. We recently witnessed the announcement of the “Clean Gas Project” on Teesside, which will be the world’s first gas-powered energy plant to fully deploy Carbon Capture Utilisation and Storage. It is being promoted by a consortium which comprises six global oil giants. This project would simply not have come to fruition without a shared vision beyond individual organisations and a realisation that if we work together for the good of the region we will all gain. In order to encourage others to live, work, invest and study in this great place, we need to build a flourishing ecosystem. We need to encourage all our businesses to thrive and prosper – and be a magnet for talent. • The evolving culture and attitudes. Research shows that each ecosystem is unique, working with the actors within that sector, region or country. Our proposed ecosystem is a Tees Valley roadmap. Our role in driving this ecosystem is respecting your individual objectives but putting those goals in the context that if we get this right, we as a region will grow wealth, create impacts and generate respect and recognition for the Tees Valley. 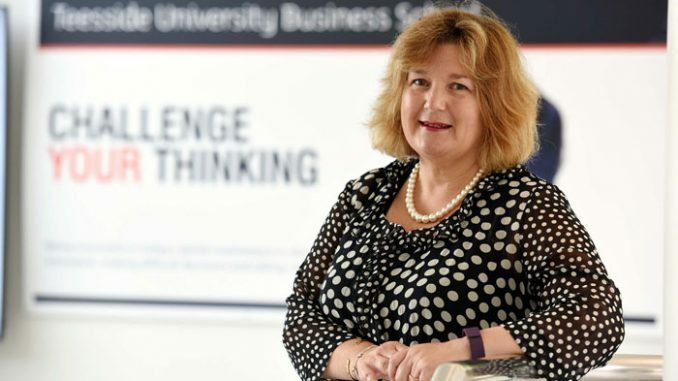 The opening of the Business School builds on earlier work, led by Professor Jane Turner here at Teesside University, to propel the region forward by hosting a number of interventions. In September this year, we hosted the Prosperity Conference when we received your pledges to continue and cascade the conversation. So what next? As a university, we appreciate the wider impacts of these challenges, and are leading the way in creating an effective ecosystem here in the Tees Valley. The new Business School sees us launch the roadmap to building this ecosystem, and a call to engage. As part of our launch we have invited views on how we as a region are currently performing in relation to the elements of the ecosystem. From these soundbites, we have gained a view on stakeholder opinions, as to where as a region we currently perform well and where we need to up our game. Effective ecosystems are a team effort and we are putting you on notice – Team Tees Valley is recruiting. In conclusion, Teesside University Business School will be a driving force in enhancing all our futures. We will prosper if we co-create a thriving ecosystem – placing the region on the map, as a connected global player. What now for Teesside’s airport?